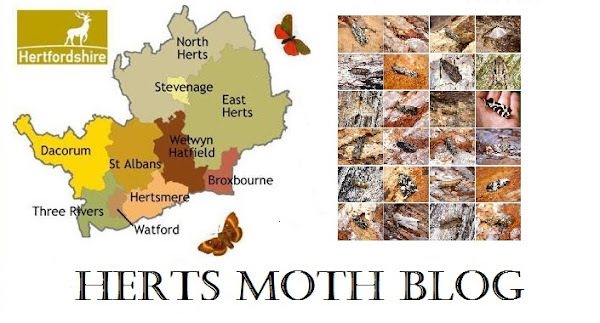 The last two nights have been ok here in Stevenage with some warmer temperatures at night but still with gusty conditions species and numbers are down slightly on previous years but there really isn't many more moth species i'm expecting this year now with the possibility of 3 or 4. I continue to swap between Actinic and Mercury Vapor just to see if anything different turns up as a result of a different light source being used. Storm Brian is raging at the moment which will make trapping difficult for a few nights. Satellite (19/10/17) - A season first Satellite turned up on Thursday night, a lovely fresh example with the bright orange 'satellite' markings on it's wings. A moth I take at both ends of the year and more commonly in Spring than Autumn from looking at my records. Turnip Moth (19/10/17) - It had been a few weeks since I last saw a Turnip and so although this specimen was very faded, it was welcome in the trap as it was 'something different'. Vestal (20/10/17) - Last night I was just taking out the trash (as the Americans put it!) and noticed a pale moth fluttering around the rain guard of the trap, initial feelings was that it might be a Mottled Umber but I turned to grab my net just to make sure and was very pleased to reveal that I was wrong and it was in fact a year first Vestal and the 3rd record for the garden of this species having taken two in the same week in 2013.